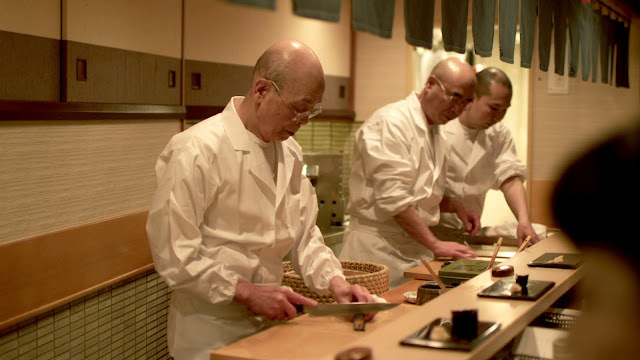 The slight but charming Jiro Dreams Of Sushi occasionally manages to attain the ethereal air of subconscious lore-building it clearly shoots for, but more often than not reaches merely the height of your average episode of Masterchef. Whilst there is a great deal of endearment towards the titular Jiro to behold and to become involved in, what more has this got to offer as a documentary than near-endless shots of dead fish, passably interesting morsels though these are, for a time? In a rare departure from focusing on Jiro, director David Gelb allows us to follow a tuna dealer around a fish market, drifting off into a musical section whilst he peruses fish carcasses of dubious quality. Whilst it may be ironic that this is pretty much the sole section of the film that feels dreamlike, and that it doesn't feature Jiro, the effect is to segment Jiro and his little restaurant as set apart from the rest of the world. It works. The 'rest of the world' sections, rare though they are, feel busy, bustling, annoying distractions. Jiro's restaurant, with its conclave of apprentices, feels like a monastery dedicated to mastering the zen art of cutting up raw fish. Entering it through Gelb's lens can, at times, feel like a semi-religious experience. Again, this touches on one of Jiro's concerns, considering the history, the lore, the immense Weight Of Destiny bearing down on Jiro, as he marches towards sushi perfection. At times, Gelb gets this spot on and Jiro excels when it is considering Japanese cultural staples such as the handing down of power from father to son, the role of masters and apprentices and the dedication to family. Too often though, like the rest of the film, Gelb becomes satisfied with shooting Jiro like an episode of The Great British Bake-Off, leaving wide considerations at the door. There's very little tangible content here about the history of sushi and where Jiro has taken it to. Gelb dips into it and then decides to ignore it, tantalisingly promising us that Jiro has invented new sushi dishes but then never proving the pudding. Like a trip to a sushi restaurant this eventually proves surprisingly light on edible content and some of what is here doesn't equate to much. The experience though is worth playing along with briefly, if only to gain an fingernail-level insight into something as inherently interesting as the art of raw tuna.